Summary: Sometimes a friend is the secret to sweet dreams. An anthology of missing scenes. A warm fuzzy fic for Robyn who asked me to use this title. Beta'ed by Robyn. Thanks muchly! Spoilers for all four seasons and bits of dialogue from a handful of episodes. "One week, and I promise, I promise, we'll be out of your hair." The unfamiliar noises drew one cranky detective from deep sleep. As his eyelids reluctantly lifted, his other senses reported in, reminding him of his two newest loftmates -- one clingy gorilla, no, barbary ape and one hyper grad student. Jim groaned and rolled over, squinting at the small bedside clock -- just after 3 a.m. With another groan, he buried his head in the pillows, muttering into them, "Go to sleep, Larry." Frowning at the second noise and recognizing the low tone as belonging to his other roommate currently snoozing on the couch, Jim raised his head just a bit. A part of him felt the need to worry, realizing that whatever Sandburg was dreaming about, it wasn't fun. However, another part protested that worry. He's an adult, not some kid who needs looking after. And this is just temporary. The half-murmured voice broke off with an awakening gasp. Before Jim could take a breath to call downstairs, the gasp was followed abruptly by a loud thud and a muffled curse. Quickly shifting upwards, Jim peered over the railing of the upper bedroom. "Chief?" Blair, sitting on the floor between the couch and the coffee table, blankets strewn about him, glanced upward as he pushed loose, tangled hair out of his eyes. "Jim? Oh, sorry, man, I didn't mean to wake you. Man, I haven't fallen out of bed in....years! Geez." He scrubbed at his face with one hand while waving at Larry's cage with the other. "Sh, sh, Larry. It's okay." Jim rolled his eyes, but managed to stifle a chuckle at the odd conversation between Sandburg and Larry. He cleared his throat, then asked, "Are you okay?" "What?" Blair looked up again. "Oh, yeah, I'm fine. Just startled. The explosion woke me--"
"Explosion?" Jim's eyebrows rose. "What--?" Blair interrupted quickly, waving a hand in the air. "The one at the warehouse. I was dreaming about it." He started gathering up the blankets before pushing himself up and getting resettled on the couch. Jim relaxed. "Oh. That explosion." He frowned. It hadn't occurred to him that the explosion itself might be bothering Sandburg. And just how often do you think grad students have their homes blow up -- while they're in them, Ellison? "Uh...so you're sure you're okay...and all?" Sandburg met his eyes again as he lay back down and smiled a little. "Yes, I'm sure." He closed his eyes. Waiting for another awkward moment, Jim hesitated, then pulled back to slide underneath the comforter. "Okay. Night, Chief. Uh...sweet dreams." Blair chuckled quietly. "Hmm....night, Jim." He yawned and added in an already half-asleep voice, "Thanks." "The Chinese believe when you save a man's life you become his blessed protector." I really need to start looking into getting this room a real door... The thought bubbled through Jim's brain as he hurriedly swatted aside the curtains hanging in the doorway of the small bedroom for the third time that night. Only two nights after Lash had kidnapped and tried to kill Blair, the nightmares had yet to taper off. Granted, they weren't screaming nightmares, but listening to the panicked mutterings and occasional words drifting outwards from the bedroom wasn't something Jim could do without intervening. So Jim sat down on the edge of the futon -- again -- and gently grasped Blair's shoulders, shaking him lightly. "Blair. Chief. It's okay. It's just a dream." Blair stilled, then shivered once before opening his eyes, blinking several times in the low-lit room. Jim released the younger man as he raised one hand to cover his face. "Oh, man..."
Jim watched and waited, listening for the heartbeat he could just hear on the edge of his slowly-being-understood abilities to slow down. I can hear his heartbeat...without really trying... Shying away from those thoughts, he glanced about the darkened room, his enhanced sight picking up a smattering of artifacts creeping out from a couple of ratty packing boxes. Clothes spilled from another box, unmatched socks dangling over the flaps. A stack of books rested against the wall next to the fire escape door. An oddly shaped clay something-or-other filled with an assortment of pens and pencils teetered on an uneven base next to Blair's reading glasses and a few framed photographs on the tiny bedside table. The soft scent of vanilla candles hung in the air from earlier that evening. A long sigh drew his attention away from the room and back to temporary loftmate -- he could almost hear Simon's disbelieving snort, "You're thinking about a real door, Ellison; that ain't temporary." Later. Softly, Jim asked, "You okay?" Nodding behind the concealing hand, Blair managed a muffled "Yeah." He sighed and lowered his hand to rest on the blankets. "Yeah. Just more of the same. Mixed-up memories and sometimes Lash trying to tell me he isn't dead." Replacing one hand on Blair's shoulder, Jim said quietly, "He's dead. Trust me." It wasn't anything he hadn't already said a dozen times, but if Blair needed to hear it, he'd oblige. Blair blew out long breath. "I know." He smiled shakily. "Thanks for waking me up -- again. I promise to get past this. Someday." Jim chuckled and patted Blair's shoulder. "Just give it time, Sandburg." He stood up and watched as the other man rolled onto his side and readjusted the blankets. Smiling, he headed for the doorway. "Night, Chief." "Night, Jim." Blair's quiet voice followed him as the detective walked towards the stairs. Pausing at the base of the stairs, Jim whispered, "Sweet dreams." "Trust me. You can save the world here." No matter how much he rubbed his eyes, the golden haloes persisted -- even through closed eyelids. Blair sighed and rolled over in the hospital bed, or at least tried to. Monitor leads and IV lines thwarted his attempt and he nearly gave up before finding an acceptable position. Facing away from the door, he opened his eyes and stared at the magazine resting on the chair -- the empty chair -- pulled close to his bedside. A partially folded blue blanket was draped over the chair back. Outside his room, he could hear the night nurses quietly talking and going about their rounds, checking on their sleeping patients. Sleeping except for me, that is. Half-remembered images, words, and feelings along with the golden tint to his world had left him in a perpetual state of exhaustion, but he still couldn't sleep. The doctor said if all looked good in the morning, he could go home and sleep in my own bed. After discovering from Simon that Jim had spent nearly every moment with him in the hospital, Blair had finally convinced Jim to go home after visiting hours were up earlier that evening. His friend, still recovering himself from the loss of his sight, looked haggard and in desperate need of sleep. Blair wasn't sure just how he'd won the argument, but Jim had gone home, promising to be back first thing in the morning. Now, however, he was wishing he hadn't told Jim to leave. Curling his arms carefully, Blair hugged the thin hospital blankets to his chest. The previous nights hadn't been terribly restful either, but he'd slept off and on, always waking to find Jim next to him, ready to soothe him back to sleep, reminding him that he was okay, that it wasn't his fault, that nobody got hurt, that nobody blamed him. That the fire people couldn't hurt him. Blair squeezed his eyes shut but popped them open again as a flash of orange-yellow light streaked past, mocking his desire for rest. With his eyes open, all he saw was a glow around every object in the room. With his eyes shut, all he saw were golden flickers. Great. He stared again at the chair, his eyes fixing on the blue blanket. The one that Jim had used. Inching closer to the edge of the bed, Blair stretched out one hand, fingers gracing the edges of the rough cotton. He gritted his teeth and pushed himself just a little closer. Got it! Gathering a handful, Blair tugged the blanket to him, watching the folds fall open with a soft whoosh as he maneuvered it over the bedrail and onto his bed. He fingered the material for a moment, abruptly feeling foolish for wanting to hold something that Jim had used. Oh, what the heck. Why not? Awkwardly draping the blue blanket over his shoulders, Blair pulled it up to his chin and closed his eyes again. Colors flashed behind his eyelids, but he resolutely ignored them, concentrating instead on the memory of Jim just before he left to go home. Five minutes later, the night nurse pushed the door open to check on her patient. She smiled softly at the sight that greeted her. Fast asleep, Blair still clutched the blue blanket in his hands. After a quick check of his vitals, the nurse adjusted the blanket to cover Blair more fully, then exited, leaving the man to his rest. "That's his friend in there." Eyes drifting closed, Blair let his hands -- and the book they held -- drop into his lap. The back of his head touched the wall behind the bed and he shifted once, pondering the idea of perhaps laying down to go to sleep. A few seconds passed and the sensation hit him again, making him sigh and open his eyes. He glanced at the bedside clock and shook his head. Way too late...early...whatever...to be awake. After a wild day of being stuck in an elevator that kept dropping with a bomb ticking down only a few feet away, the blessing of sleep called but just wasn't to be his. Every time he closed his eyes, the remembered feeling of falling -- rapidly -- struck and forced him away from sleep. "Man..." he whispered, not wanting to wake the other resident of the loft, currently snoozing just above him in the upper bedroom. At least Jim will be coherent tomorrow. Setting the book aside, Blair swung his legs out and sat on the edge of the bed. "So much for Plan A; time for Plan B -- sleepytime tea, Naomi's special blend #3, guaranteed to give you a restful night." Smiling to himself, he stood and grabbed the robe at the end of his bed. Leaving it loose on his frame, he tiptoed from the room, pausing just outside the french doors to make sure he hadn't woken the sleeping sentinel. Not hearing any movement from upstairs, he yawned widely and shuffled into the kitchen. After filling the teapot with water and setting it on the stove to heat, Blair hunted through the cabinet, looking for the tea box. He shifted boxes around and reached further inside the cabinet to snag the tiny box. As he pulled his hand out, the robe sleeve caught the corner of plastic container full of loose teabags. The container fell to the counter with a clatter, spilling teabags everywhere, and startling Blair into releasing a muffled yelp. He jerked backwards, losing his hold on the tea box which dropped into the sink, landing noisily on a forlorn spoon. The loud noises from above and Jim's cut-off hoarse shout sent Blair whirling away from the mess on the counters and floor. He paused long enough to twist the burner control to "off," then hurried towards the stairs. No answer, just a low, nearly inaudible...sound that raised his blood pressure a notch or two. One hand gripping the bannister to keep his sock-clad feet from slipping, he dashed up the stairs and jerked to a halt next to the bed, suddenly unsure of what he should do. Jim had woken him up from a handful of nightmares in times past, but never the reverse. Jim made that sound again and Blair's hand went down to touch the sleeping man's shoulder almost of its own accord. "Jim." Blair spoke quietly and insistently. "Jim. Wake up." A shuddering breath preceded two blue eyes blinking open to stare at him. "Blair? What--?" Blair licked his lips and pulled back his hand. "You, uh, you were dreaming, I think. Didn't sound pleasant." The still half-asleep detective blinked again, staring at Blair with a peculiar dream-like expression on his face. "I was watching you in the monitors. The elevator dropped. All the way. I saw...I watched...then the bomb--" He stopped abruptly, swallowing hard and blinking several times. In the barely moonlit shadows of the room, Blair caught the rare sight of unshuttered emotion in Jim's blue eyes -- despair at what might have been. He remembered hearing Jim's panicked voice over the speakers that second time the elevator dropped, but hadn't realized until now just how panicked. His stomach muscles tightened in empathy. Hesitating only a moment, Blair settled on the edge of the bed and touched Jim's shoulder with a few fingers. "It's okay, Jim. It didn't happen." Jim just looked at him and Blair wondered if the man was even truly awake. He dared to grip Jim's shoulder and give it a tiny shake. "See? I'm right here. It's okay." A smile flickered across the other man's face and the sadness left his eyes before heavy eyelids descended. "Good..." The word was slurred but understandable. A few breaths later, Jim was once again sleeping. "All the hatred...it was just eating away at me." Blair held the loft's front door open and stepped aside to let Jim enter first, watching the man closely as he passed him in the doorway. Still dressed in the standard prison outfit with Simon's borrowed overcoat thrown haphazardly on top, Jim didn't look the part of a detective. His haunted eyes weren't helping. Blair closed the door, then quietly locked up before turning to see Jim still standing in the midst of the living room, one hand resting on the back of the nearest couch. He'd turned on the table lamp, casting a sphere of light around the couch and him. Although Jim's back was to him, Blair knew a little of what Jim had to be feeling. His posture and silence said it all. Sorrow. Regret. Bone-deep soul weariness. Walking across the room, Blair carefully edged closer to the taller man, leery of overcrowding him after Jim's experience with being cooped up in the prison. He knew the man would be needing his freedom and space for awhile. They'd briefly reconnected before leaving the prison itself, but Jim had grown quiet and pensive on the ride back into Cascade. Blair gently laid one hand on Jim's lower back. "You okay?" To his surprise, Jim chuckled lightly. "You keep asking that, Chief." He kept his eyes forward, looking at the wall or the balcony or something else entirely, Blair wasn't sure. Answering the chuckle with a tiny smile, Blair shot back, "And I'm gonna keep asking it until I'm satisfied that you're okay." He paused, then added, "So are you?" Finally meeting Blair's eyes, Jim shrugged. "Yes. No. I don't know." He sighed and rubbed his forehead. "I'm tired and sore. My eyes are still stinging. I miss my own clothes." His stomach reported in and he grinned briefly. "And I'm hungry." Blair slid his hand upwards on Jim's back, nudging him toward the bathroom. "Go take a hot shower. Rinse out your eyes while you're in there. I'll get your robe." He wrinkled his nose. "And I think I'll burn the prison get-up if you don't have an objection." Halfway to the bathroom, Jim shed Simon's coat and draped it over the dining table chair. "No objection here. Just don't tell Simon." Jim glanced at him as he stopped in the bathroom doorway. "Pizza? Sure. Anything's better than prison fare." He shuddered. Later Blair wondered how he managed to even snag one slice of the large "the works" pizza. After a shower, dressed in his favorite fuzzy gray robe, feet cocooned in a new pair of warm white socks, Jim had fallen on the hot pizza, devouring the first piece even before Blair had paid the delivery boy. And now he's crashed on the couch, drooling on one of my favorite throw pillows. Empty pizza box in one hand, Blair paused in front of the couch, watching his sleeping best friend hug the pillow closer to his chest. A frown line etched its way onto Jim's forehead and he murmured quietly but didn't wake up. Shaking his head, Blair continued into the kitchen, dumping the box and the empty water bottles. Jim had guzzled three of those down amidst the pizza inhalation. Blair made a mental note to check how many bottled waters they had left -- tomorrow. He yawned widely and forced his eyes open. After spending too many days sleeping either in the car or in the closet-sized room at a Starkville hotel, Blair was ready to sleep in his own bed. Heading back to Jim's side, he sat on the coffee table and placed a hand on Jim's shoulder, shaking it gently. "C'mon, Jim, time to go to bed, man." Jim mumbled unhappily at him from sleep and seemed to push himself further back into the couch. Blair tried again and got a muffled "no" for his troubles. Sighing, he stood and walked down the short hallway by his bedroom to the linen closet. Returning to Jim's side, Blair draped a spare soft blanket over him, tugging it down to cover his feet and tucking it around his shoulders. Jim shifted a bit in his sleep, his forehead creasing more. Sitting again on the coffee table, Blair touched Jim's forehead, smoothing out the lines with gentle fingers. "Sh, sh. Just sleep, Jim. You're safe. You're home." He stroked aside a few stray tendrils of hair. Jim sighed, relaxing. Blair slowly pulled back, then stepped over to the other couch, yanking the afghan down as he stretched out on the cushions. His bed wasn't going anywhere and he wanted to be close by if Jim needed him. A yawn escaped him and as sleep carried him away, he murmured, "Sweet dreams, Jim..."
"Friends help each other. That's what we do." As lightning from the storm outside continued to brighten the darkened room in jagged flashes, Jim rubbed his forehead, willing away the headache slowly developing there. Memories and half-dreams had dragged him from sleep, leaving him too disturbed to rest. He never liked dealing with the past, his past especially. Too much pain and too many memories he preferred to leave alone. I'd had all of this nicely ignored and buried. Dealt with. He grimaced. Why now? Why ever? Jim shook those thoughts away. Not now. Later. He straightened a little on the edge of the bed and stared out the window at the rain streaking downward on the glass. Memories from his childhood crowded into his mind. Most were painful, filled with rules and competition and striving for a father's approval. Others were vague, fuzzy, remaining every out of reach, some hidden behind doors not ready to be opened. But there were a few...a few that spoke of simple joys. With a bittersweet fondness, he remembered the hero worship and unconditional belief that glowed in little Stevie's eyes. Comic books, superheroes, touch football in the park, and teaching his younger brother to ride a bike ­ those stood out during the time before they began drifting apart. Further back, he remember his father's rare laughter and smiles. And he remember his mother's quiet voice, singing him to sleep. "Hush, little baby, don't you cry..." He remembered the scent of her perfume and the touch her lips on his forehead as she wished him "sweet dreams" each night. His tentative smile faded abruptly as the more unpleasant memories of his parents' arguments echoed in his ears. Of Stevie's confused unhappy crying in the nursery. Of comforting and distracting his younger brother and trying to be a grown-up the day his mother left, never looking back as she moved on to a new life. Thunder roared loudly, startling Jim out of his depressing thoughts. Dragging a hand over his face, he pursed his lips. Get over it, Ellison. She left. Life went on. He stood and after a moment's thought, padded downstairs, tying the belt of his robe as he descended. Now, staring at those doors, Jim pondered waking Blair and asking if he was up to a middle-of-the-night chat. Jim's lips twitched into a smile. Knowing him, the answer would be yes. He walked over to the doors and laid one hand on the wood frame. Although he wasn't ready to talk yet and he knew the storm had yet to reach its peak, much less pass, simply knowing amidst all the turmoil from his past and present that his friend was there and always would be was enough. Jim leaned forward, touching his forehead to the doors, saying under his breath, "Thank you, Blair." Minutes later, once again in his bed, Jim sighed and closed his eyes, finally letting the whispered benediction Blair gave him earlier that evening banish the shadows from his rest. Blair walked into the hotel room and just stood in the half-lit shadows. A few feet away, outside the open door, he could hear Jim exchanging a few parting words with Simon and Megan, making plans to meet up in several hours for supper. The words washed over him without really registering, but he did pick up that they'd decided to stay in Sierra Verde the rest of the day and take the first flight out the next morning. Selfishly, Blair was glad for the delay. He needed the rest. Knees feeling suddenly wobbly as everything -- his post-death life, Alex and her madness, sore ribs, coming way too close to a second death by airborne toxin -- caught up with him all at once, he sank down on the kingsize bed, then lay flat on his back. Suppressing a moan at the resurgence of aches in his body, he dug the heels of his hands into his closed eyes. The adrenaline and anxiety of the last several days had kept most of pains -- both physical and emotional -- away. Jim turned from locking the room door and paused at the sight of Blair stretched out on the bed, much like he'd been just a few days earlier. The sentinel just watched the younger man, once again absorbing the reality of the rise and fall of his chest, the quiet raspy breathing, the heartbeat that he couldn't hear enough of. As he watched, Blair relaxed by degrees, slowly unwinding in preparation for sleep. As he did so, the tiny hitches in his breathing reminded Jim that Blair's ribs had been bruised if not cracked by the vigorous CPR just days ago. Leaving his partner in Cascade to recover while he and Simon chased after Alex had been one of the more difficult things he'd ever done. Having him show up in Sierra Verde the next day had been a shock but something he should've been expecting. He's Sandburg. Not someone who's gonna stand by and watch you walk into danger alone. Blair could feel Jim's eyes on him, cataloguing his heart rate, his breathing, his very being. A muffled cough slipped out and he winced, feeling his ribs protesting the movement. The doctor had warned him about weakness in his lungs and wanted him to take it easy for a bit. I don't think running after rogue sentinels in the jungle counts as taking it easy. Another cough struck and he bit down on it. Man, I'd better not be getting sick. Not what I need right now. He lowered one hand to gently rest on his breastbone. The bed dipped slightly and a hand touched his where it lay on his chest. "Chief? You okay?" Jim frowned at the coughs and stepped around the bed to sit on the side of it. He rested his hand on Blair's, running his thumb gently over his fingers. "Chief? You okay?" Blair's other hand dropped away from his face and he opened his eyes. "Yeah. Just tired. A little sore." He struggled to sit up, gasping as his ribs twinged. Reaching out, Jim pressed on his shoulder. "Maybe you should stay down." But Blair persisted and Jim assisted him into a sitting position, leaving one hand on his back for support. "You don't look too great there, Chief. You look like you could sleep for a week." His eyes focused on the colorful bedspread, Blair chuckled weakly. "Probably so." He fell silent, picking at the loose threads under his hands. Jim ran his hand up to Blair's shoulder and squeezed it lightly. "Blair? Are you sleeping?" Blair shrugged. "More or less. Maybe more less than more. I have...lots of dreams. They're, uh, not...well, not nice dreams." He looked up and caught the concern and something else in Jim's eyes. Shifting slightly, he turned to face the detective and took a breath. "Most times I see Alex. Sometimes I see the jungle. Sometimes...older stuff. Sometimes--" He broke off, then stammered, "Sometimes I see...you." "Me." Jim said bluntly at the same time. He sighed and glanced away momentarily. "I don't know what I was thinking, throwing you out, making you leave your home..." His eyes shone with regret. "Jim." Blair interrupted softly. "You were...reacting to the dangers you sensed, even if you didn't know what those dangers were. I understand that." Pausing, he grinned weakly. "I may not like it, but I understand it." Sentinel senses still tingling with new energy and new awareness from the grotto, Jim knew beyond any doubt that Blair spoke the truth. A smile on his face, he shook his head. "I'll never understand you, Chief." Blair's eyes twinkled. "Ah, but that's what makes life interesting, right?" Jim broke out into laughter and dragged Blair into his arms in an awkward hug. Blair returned it unhesitatingly, ignoring the pain that spiked in his ribcage. A moment later, Jim released him abruptly, his hands already checking Blair's ribs even as he sputtered his apologies. Rolling his eyes, Blair waved Jim's hands away deliberately put his arms around Jim again. A moment passed and Jim returned the embrace, more gently this time. After a bit, they parted and Blair cleared his throat and pointed out with a grin that there was only one bed. Jim offered to thumb-wrestle for it even as he prepared to make himself a bed on the floor. Blair laughed and knew that this night held no shadows. Although unspoken, the words "sweet dreams" hung in the air, promising him a peaceful rest. "It's just a book." "It was your life." Jim looked up from the newspaper as Blair stood in front of him, holding out a thick sheaf of paper bound in a protective plastic binder. He looked at Blair, then at the binder again. "Which is it?" Blair hesitated, then answered, "The sentinel thesis. I know I'm not turning it in or anything, but it's complete now. At least as complete as it's gonna get." Seeing that Jim wasn't going to take it from him, he laid it on the coffee table. "I thought you'd want to read it." The newspaper lost its appeal and Jim set it, nicely folded, aside on the couch. The innocuous binder rested on the table, daring him to pick it up. He remembered all too well reading the introductory chapter and finding it so...unpleasant. Jim wasn't sure he wanted to tempt fate again. Folding his hands in his lap, he looked up at Blair, still standing next to him. "Are you sure? That you want me to read it, that is?" "Yes." The answer was quick and sure. "I think...I think it might help. I want you to read it and then we'll decide what to do with it. Shred it, burn it, erase it from my computer, whatever. I'll do it. This had stood between us for too long and I want it over." Blair sliced a hand through the air in demonstration. Jim leaned forward and picked up the binder. "What if I want you to keep it?" Chuckling, Jim shook his head. "Chief, I said it before: This was your life. It is your life." 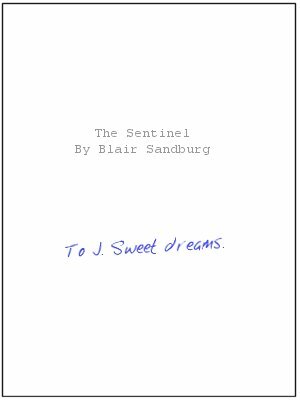 He ran a hand over the front cover of the binder, reading the title of the thesis: The Sentinel by Blair Sandburg. "In some ways, I think it always will be." "Still...I don't want you to have to worry about me or some other idiot...exposing you. Again." He tapped the binder in Jim's hands. "This is it. No more. I'm gonna start working on the closed societies' paper and leave the rest of it behind." Jim looked up again, finding Blair's eyes on him, uncertainty shining forth even as he bounced once or twice on his toes. It was good to see that bounce again, even if it was a nervous reaction. Blair had become more...subdued after his death -- that still makes me want to hug him to make sure he's real -- and Jim had missed seeing the boundless energy. "Sandburg, the only idiot that's going to expose me is probably gonna be me." He grinned. "Conner's running out of creative ways to explain away my leaps of 'intuition'. And Simon?" He and Blair chuckled softly at the thought of their captain trying to deal with all the "crazy sentinel stuff." Blair smiled and gestured to the binder. "Anyway, you can read it or not read it. It's up to you." He shifted his weight from one foot to the other, then backed a step away. "I think I'll go...do laundry or something." Jim watched him vanish into the bathroom to gather the clothes, then looked down at the binder in his hands. Slowly, he opened it, turning the title page to find a dedication page. He blinked a few times as he read the few words in the center of the page, then smiled softly, smoothing one finger over the handwritten text. A promise. A vow. A wish. "Close your eyes now and rest."